I loved the original Geometry Wars on Xbox Live Arcade. I played so much of that game. Despite the amount of time I put into it I haven't thought about it much since my Xbox 360 died a few years ago. But then Geometry Wars 3 Dimensions was a PS Plus game for free in July! I grabbed it for my Vita and have been trying it out. Besides the stage distortion (the "dimensions") being a little annoying, I like the game. And it's nice to finally have it portable! It has a ton of new modes and stages that are three dimensional instead of just flat. But the core gameplay of the game I loved is here, and that's what counts. All the classic modes are present and accounted for, which makes me very happy. Pacifism has always been my favorite Geometry Wars mode and to see it represented is fantastic. If you don't know, Pacifism mode takes away your weapons and only spawns 2 things; enemies that follow you and gates. If you pass through a gate it explodes and destroys enemies in it's blast radius. Pacifism mode becomes a game of kiting a bunch of enemies after you as close as you can while navigating through gates to blow them up. It's so much fun! 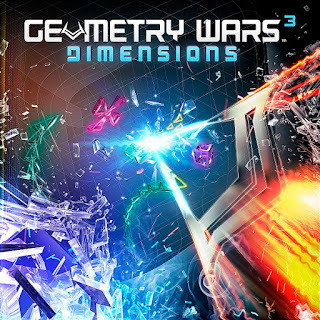 Geometry Wars 3 Dimensions is a great addition to anyone's handheld or mobile gaming library. It hasn't grabbed me like 2 did. It's still just as good (and largely the same), but I've not touched it as much. I remember being into 2 so much. But, it must have been the right time and right place. Or maybe Geometry Wars 2 just came out on the right system at the right time. I remember loving Xbox Live Arcade early in the 360's life cycle.